Resolutions Aren’t Enough. You Need An Anthem. Here we are. 2010. Another decade flew by, and yet we aren’t teleporting anywhere or driving hovercrafts, much to my chagrin. Every year we make resolutions — to quit smoking, to lose weight, to join the gym, to find the “one,” to get that job or start that business that’s going to let us retire early. But before you know it, 10 years are gone. That’s not to say baby steps on the ladder of life haven’t been taken, but, somehow, you thought you’d be farther by now. So what went wrong? 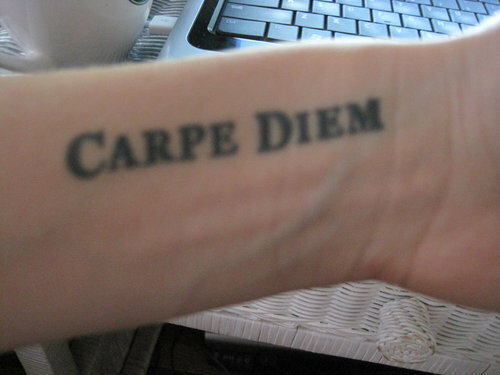 You read the books, you tattooed “Carpe Diem” on your arm, you joined the gym. What happened? Why aren’t you lunching with Oprah and Bill Gates yet? Oh, I don’t know the answer. And that isn’t what this post is about. Maybe Tony Robbins has a blog that could help you there. I didn’t ever really make new year resolutions in the past. I tried. I said all those same things above. I’ve had small successes — I gave up meat for Lent when I was 14-years-old, and 23 years later, I’m still a vegetarian. I figured, if something was worth giving up for 40 days, it was probably worth giving up for good. Mind you, the next year, I gave up Lent for Lent. One year I gave up fast food for the whole year. That was monumental for a latch-key kid who grew up on TV dinners and McD’s. However, I still grab an Extra Value Meal now and again. So why didn’t that one stick? I blame it on whatever they put in the fries (Note: Don’t read Fast Food Nationif you love McDonald’s fries). Instead of resolutions, something that I did, and I’m not sure where the inspiration came from, was that whatever the first song I heard was after the new year rang in became my anthem for the year. This one is tricky because DJs love to play New Year’s Day by U2, so I began to set rules after hearing that one every few years. A few of the memorable songs that became soundtracks to my years were “Let Love Rule” by Lenny Kravitz, “Touch of Grey” by The Grateful Dead, Led Zepplin’s take on “Nobody’s Fault But Mine,”and “You’ve Got Another Thing Comin'” by Judas Priest. I was always a little surprised how these songs would turn up during the year to get me through. They became my mantras, my anthems. The bottom line to succeeding at New Year’s Resolutions or any goals in life is to write them down, give yourself deadlines, and outline actionable steps to how you will achieve them. I’d like to add, get yourself an anthem. Every soundtrack to life needs one. I’m hoping that when I turn on the radio this year I’ll hear the theme to “Rocky,” because, let’s face it, the song rules. However, it will sure make achieving your goals this year a hell of a lot more fun. Commit. Know the result you want. Do the work. Hear your anthem. This entry was posted on Saturday, January 2nd, 2010 at 1:59 pm	and is filed under Advice, blogging, brand, Music, music and social media. You can follow any responses to this entry through the RSS 2.0 feed. You can leave a response, or trackback from your own site. I'd post a link, but your editor has been programmed to disallow pasting (as well as arrow keys, etc. ), but given your choice of songs, try typing "Veteran Cosmic Rocker" into youtube, to get the song by Moody Blues.As far as my theme, it's "Dearg Doom" by Horslips, at least, this time of year when I'm thinking of snowboarding. The last song on the Gladiator soundtrack is one of my anthems. After that, I'd name The University of Texas Fight Song, "Money" from Pink Floyd, and "Imagine" by John Lennon.When I set goals, timelines and people/activities that will help you achieve your goal are so key.